While it seems like dogs may react differently to the weather than humans (they have different biology after all), they can actually be more susceptible to weather extremes in some cases. A general rule of thumb to use is, If the outdoor temperature is too hot or cold for a human to be comfortable, it’s too severe for your dog. Hot temperatures, combined with humidity, can cause dehydration and heatstroke. Temperatures lower than 32 degrees Fahrenheit can cause hypothermia or frostbite. Some dogs prefer to play and enjoy the outdoors, regardless of the weather. If you leave your dog outside when it’s cold, provide him with shelter to protect him from severe weather. A dog house that has a solid, raised floor with straw or bedding for insulation will help keep him warm. Cover the entrance with a flap to keep drafts out. Dogs in cold temperatures need plenty of food; staying warm uses up extra energy. Make sure that water is available and that it’s not frozen. 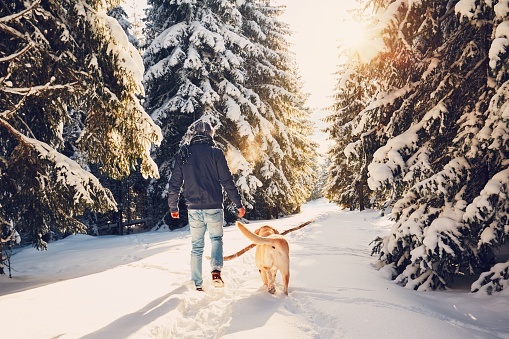 During cold winter months, walk your dog during the warmest hours of the day. Make sure that his paws are protected from ice, which can cause frostbite and cut the pads. Even breeds that are more tolerant to cold should not be left outdoors for long periods of time in below freezing temperatures. Safe summer temperatures vary depending on humidity levels. For instance, a dog left outdoors in an arid climate may be fine in temperatures of 85 degrees, provided he has access to shade and water. However, a dog in a high-humidity climate at the same temperature might be in danger for heatstroke. Allow your dog to play outdoors as long as you can join him comfortably. Make sure he has plenty of cold, fresh water and access to shade. On extreme heat days, walk your dog in the early morning or late evening, when temperatures cool off. Place your hand on the sidewalk first to ensure that it’s not hot enough to burn the sensitive pads on your dog’s feet. Never leave your dog in the car during warm weather. The Humane Society notes that on an 85-degree day, a car with its windows partially rolled down reaches 102 degrees in only 10 minutes. While most dogs will be comfortable in the same temperatures as their humans, some breeds are more susceptible than others. Dogs with short snouts, such as pugs, are more at risk for heatstroke than others because the hot air enters their lungs more quickly than dogs with longer snouts. Dogs with thick coats, such as huskies, overheat more easily than those with short coats, especially if they haven’t acclimated to a warm climate. Small dogs with short coats, such as Chihuahuas, get cold faster than other breeds. 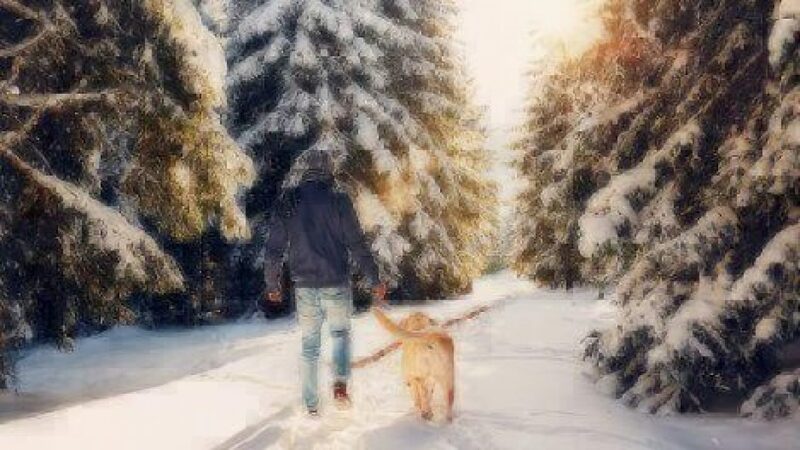 Provide your dog with a sweater during winter walks and keep his outdoor time short. Other breeds, such as poodles, are susceptible to cold if their coats are groomed short. Keep a close eye on your dog during very hot or very cold weather. 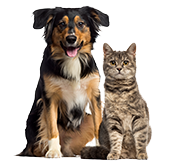 Seek veterinary treatment if his symptoms indicate a weather-related condition. Hypothermia can cause death. If you suspect your dog is suffering from this condition, move him out of the cold and seek immediate veterinary attention. If you suspect your dog is suffering from heatstroke, spray him with water or cover him in water-soaked towels to cool him off. Provide him cool water and encourage, but don’t force him, to drink. Move him indoors or to a shady area. Seek veterinary care. Want to learn more about your pup? Check out Can Weather Affect a Dog’s Behavior?, Getting Your Dog to Wear a Coat or Sweater, and Do Outdoor Dogs Need More Food In Cold Weather? at Cuteness.com!